I found out yesterday it is really the simple things that can make my day. I found this project when I was going through my books and I thought it looked simple, easy, and diff erent. I tried it out to see if it was worth sharing with you. Well, I really liked it, but my family didn't seem to find it such a big deal. I guess that's why I do so well with preschoolers--I have the mind of one. 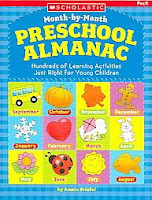 This is another project I found in the "Month-to-Month Preschool Almanac," by Annie Stiefel. It didn't look like much to read, but it sounded easy. 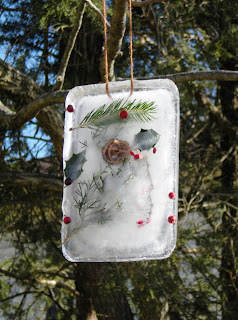 The first part of this project is to go on a winter nature walk with your little one and see if you can find any bits of nature. I picked up a walnut shell, some cedar tree branches, some holly leaves, holly berries, some red berries from another kind of bush, and some evergreen branches. Next you will need some aluminum pie pans and food coloring. 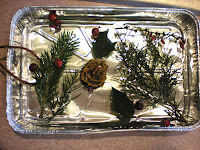 Have the children put some of their favorite nature hike findings in the pie tin then add some water . You may keep the water clear, or let them add some drops of food coloring for some extra splash. 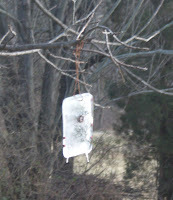 To make my hanger I took a piece of yarn, tied it in a loop and placed it in the water so it would freeze in the water. Don't place it right at the top, because it will melt out faster. Try to plae it so the string is near the center. For their hanger they have you "tie loops of string to small crafts sticks. Place a stick in each pan with the string hanging over the edge." I wasn't quite sure how to accomplish that, so I did it the other way. The next step is to freeze it. 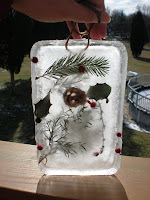 If it's cold outside, you can put them outside to freeze, or you can put them in the freezer. 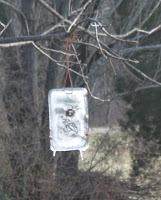 When they are all frozen, take them out of the pie pans and hang them from trees. They really look NEAT! I know that may sound strange but I was surprised how great it looked outside in the sun. I thought it would be cool (Icouldn't think of a good word, my daughter gave me this one) if you could make a bunch of small ones, maybe from a muffin tin, and hang them in the trees. It's also a great science project. You could hang one in the shade, and one in the sun. Have the children keep a chart, something like a tally sheet, to see which sun catcher will last the longest. One thing that happened that I hadn't thought about was that the sun catcher started to slowly melt and then refreeze so there were icicles hanging from the bottom. I just loved it. I took pictures, but it kept spinning around so I'm not sure how clear they came out. Those turned out so nice! I love how you used nature in it. We made something similar last week that I found on another blog, but the kids put little colorful toys and marbles in and we froze it. I was trying to post a photo, but my computer wouldn't load my photos!! 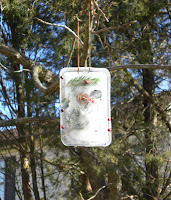 I think the icicles added to the allure of the suncatcher. Allure! Now there'sa good word to remember. I like that one. You have given us some good ideas for teaching our 18-month old. Thanks for your tips.